Milltown is rolling out the red carpet for local athlete Deirdre Mongan with a good luck party ahead of next month’s Paralympic Games in Rio. 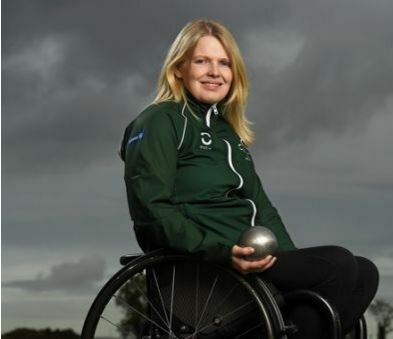 Deirdre, who is originally from Cloondroon but is now living in Co Down, will be among the Irish Paralympic team traveling to Brazil, where she will compete in the shot put F53 Class event. The mother of one has already won bronze medals on both the World and European Championships and this is her first Olympic games. “I don’t really know what to expect so I’m going to try to enjoy it and not get too over whelmed but take it all in at the same time”, Deirdre told the Tuam Herald this week. Her husband Steve and father Stephen will travel to Brazil to cheer her on along with her sister and mother-in-law, but two-year old Amy will remain in Milltown, cared for by Deirdre’s mother Mary. “The family will be over about eight days, but I’ll be there three weeks. That’s going to be hard being away from Amy but I’m trying not to think about it,” she added. “I got a bronze medal in the European championships in June which was really a warm up event for Rio but I will need to through better to have a chance of winning a medal,” she said. Before she departs however, there’s a party to send her on her way which has been organised by friends and neighbours in Milltown. Sheridan’s will host the event on Saturday evening, where local musicians will perform as friends and family gather to wish Deirdre well. “My dad was on to me telling me to be home this weekend so I’m down Friday evening and back up Sunday as there’s still a lot to do before I fly out with the team,” added Deirdre. “I’m really looking forward to catching up with family and friends as I don’t get home as often as I’d like, so this is lovely chance to meet up with everyone. Mary Hernon, who has organised the night, said it was a way for the local community to show its support for her and all the hard work that has gone into qualifying for the Games. “Deirdre has been a huge supporter of Milltown Ladies Football down through the years and her sister Ann Marie who is on the team so this a way for up to show our support for her as she heads over to Rio,” she said. This page was added on 17/08/2016.